Over the past three years, CMI-supported dialogue process has had a positive impact on people’s lives in the autonomous region of Gagauzia and in Moldova as a whole. The process has also contributed to the harmonization of legislation between the center and autonomy. Above all, the process has led to the creation of a sustainable dialogue platform where parties can address joint issues and find solutions to them. Members of the Gagauzia Working Group gathered for an informal meeting in May. 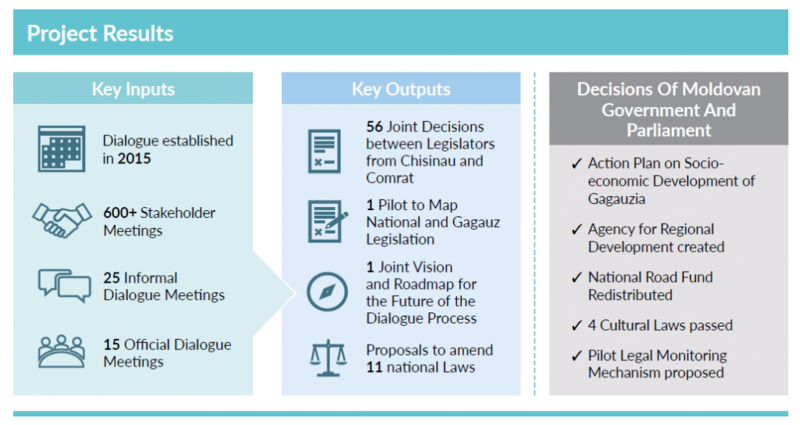 These are the key results from a dialogue process that CMI has supported and facilitated between legislators from Chisinau and Comrat over the past three years. You can find the full report of the Gagauzia Parliamentary Dialogue project here. The Gagauzia Parliamentary Dialogue project was launched in 2015 in the context of increased openness between Chisinau and Comrat. This openness provided a new opportunity to address pressing issues between the center and the autonomy, and to consider long-term solutions to improve the functioning of the autonomy within the Republic of Moldova. 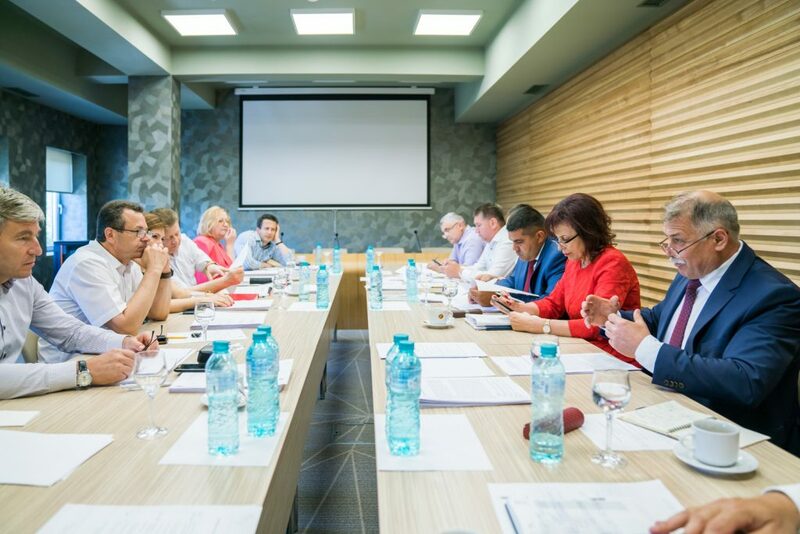 CMI, with funding from Sweden, designed a project bringing together legislators from both Chisinau and Comrat to find joint solutions to common issues involving the autonomy. The project set up an informal working group that was later on followed by an official working group made up of equal numbers of representatives from the Moldovan Parliament and the Gagauzia People’s Assembly. Establishment of an official joint dialogue platform, sustained commitment from the Parliament and People’s Assembly and cooperation between the secretariats has ensured national ownership of the process, vital for the credibility of the platform and its results. Known as the ‘Gagauzia Working Group’, this joint decision-making mechanism has become a sustainable dialogue platform where representatives from the center and the autonomy can address joint socioeconomic issues; analyze autonomy related legislation and make proposals to solve discrepancies; and support the development of joint solutions and mechanisms to strengthen the relationship between Chisinau and Comrat. Since 2015, Working Group members have developed their skills in dialogue and mediation and gained technical knowledge about how European autonomies can function. The group members have used their new skills and knowledge to find joint solutions to shared socioeconomic development and legislative issues. The Government and Parliament of Moldova have drawn on group’s decisions to create the Action Plan on Socio-economic Development of Gagauzia and the Gagauzia Agency for Regional Development, allowing investments in infrastructure and economic development. In the legislative field, the Working Group has focused on eliminating discrepancies between national and autonomy level legislation. The stakeholders are satisfied with the results of the process. “I have seen incredible changes since we initiated the dialogue process in 2015. Discussions between Chisinau and Comrat have progressed from political disagreements to joint problem solving and constructive proposals to move forward”, says the Speaker of Moldova’s Parliament, Andrian Candu. “The Working Group has made enormous progress since the start of this dialogue process – from learning to listen to each other to learning how to solve challenging issues, together. This is a huge achievement. I look forward to the work continuing in the next iteration of the Working Group”, emphazises the Chairperson of Gagauz People’s Assembly, Vladimir Kyssa. CMI’s Head of Eurasia, Roxana Critescu, highlights the importance of local ownership in the process. Local ownership is one of CMI’s core principles. The next phase of the project will continue to systematically address the harmonization of legislation and clarification of competencies in sectors chosen by the Working Group, and work towards improving cooperation between institutions in Chisinau and Comrat.